It is always a good idea to take a moment to reflect on the prior year before working on the New Year’s goals. Many of you reading this blog are likely over achievers, and as an over achiever we tend to forget to celebrate our accomplishments. We are always onto the next goal. Equally, reflection also allows us to learn from our failures. And we also get an opportunity to see what might have seemed important to us in the beginning of the year lose its importance (or at the very least lose its level of priority). So, before I get into my 2016 goals, let’s take a look at how I did in 2015. [Fail] Get back into the best shape of my life at 187lbs with 8% body fat (my 2012 personal best). This was an absolute failure. When I did my mid-year review I was off track but still making progress. I actually fell backwards and am right back to where I started 2015 at 221 lbs. The honest truth is that I did not make it a priority. We all have choices and my results prove that I made choices that were in direct conflict with this goal. I had periods of inconsistent workouts…but the straw that broke this goals back was my diet. I didn’t have a plan or a tracking system in place. And I know better, from experience your nutrition makes up 85% of the results you see in your body. [Fail] Start my MBA in the Fall of 2015. Although I consider myself to be a perpetual student, I decided mid-year that this was a goal I was pursuing not because I wanted to, but because someone else (my boss) wanted me too. I actually did a lot of thinking about what I wanted and realized that the CFO track I was on, was the wrong path. Realizing this allowed me to make some bold moves that turned out really favorably. [Success] Take 3 weeks’ worth of vacation with my wife & friends. Vegas – In February we took a 3 day trip (remember the crap I got from the office time keeper). We stayed at the Wynn and had a blast. We are not really night club people, but we do enjoy the food. We also spent the day at the day spa, another one of our favorite things to do on vacation. Lake Hemet – In May we finally used our camping gear for the first time on this 2 day trip. Vegas (again) – In July we spent another 3 days in Vegas for the 4th of July weekend. We didn’t have plans and our timeshare was open, so we decided on a last minute trip (serendipity at its finest). We even had some friends join us last minute. California Coast Road Trip- We took an 11 day road trip up the coast of California in August. House Boat @ Lake Mead – My wife’s family has a house boat at Lake Mead and we are planning a 3 day trip for Labor Day weekend in September. Kansas City for Thanksgiving – We decided to change it up this year and flew to the mid-west for a Friendsgiving. Had some really good BBQ. This was a 5 day trip. Week at the Beach – As I type this we are staying in a rented Beach house here on the West Coast for the last week of the year. We took a last minute totally unplanned trip to stay at a little cottage by the beach for 3-days in November. If you add all that up, you will see that I realized 36 days of vacation. [Success] Make room for serendipity to do its thing. The Kansas City and 2 beach trips were not planned, but a total blast and much needed after putting in some crazy hours. I didn’t plan to get Solar, but the $4,500 tax credit and 23% IRR was hard to pass up. I hadn’t planned to move to Operations or get promoted to Director. This lead to a $60,000 increase in compensation and a whole new trajectory to my career. I sent a risky email and it paid off. I had a backup plan in case it didn’t. I hadn’t planned to open up an HSA, let alone max it out. But the income from above forced me to find some other ways to shelter income from taxes. I can’t think of any other examples at the moment, but serendipity was alive, well, and embraced here. [Fail] Add an additional investment property to our portfolio towards the middle of the year. This was intentional. We decided that we didn’t want to do an investment with friends or family in order to avoid any potential problems that could hurt the relationships. Once we made that decision we realized we didn’t have the capital to add a 3rd property to our portfolio. Instead we found an alternative in Rich Uncles Commercial REIT. We only invested $5,000, and will re-evaluate an additional property in 2016. [Success] Pay additional principal payments towards our primary mortgage to stay on track for our 7-year pay off plan. That means increasing our payment by an additional $800/month in 2015. Slam Dunk! I wish I had one of those “That was Easy” buttons from Staples. As planned we paid an additional $9,600 towards our mortgage balance. Based on the plan, this amount increases to $1,600/month in additional payments or $19,200. [Success] Max out 401K with $18,000 (new limit in 2015). And contribute $5,500 to Wife’s IRA. Was on Auto Pilot. It happened without even thinking about it. We actually contributed $18,000 to my 401K, $5,500 to my wife’s IRA for 2014, and another $5,500 to my wife’s IRA for 2015. The bad news is that based on our income it is looking like we will no longer be eligible for the tax deduction for my Wife’s IRA that phases out completely with an adjusted gross income of $190K. I know this is a 1st world problem, but I am still a little upset. [Success] Add $6,000 in 12-month CD’s to our portfolio through Navy Federal at a 3% interest rate. This happened at the beginning of the year. They are set to mature over the next three weeks. We may look to renew, but need to figure out whether adding another piece of real estate to our portfolio is going to happen or not. [Success] Add $69,000 to Net Worth in 2015. This was done almost 2X over. With 3 days to go until the end of the year, it is looking like our net worth will be up by $137,000 in 2015 vs. 2014. As I write this, there have been 206,000 words published on the blog. I actually had originally had a goal of 50,000 words and adjusted it up mid-year. I never would have thought that I would do twice that new goal. I am very disappointed in the huge miss with respect to my fitness goal (#1 above). But outside of this, I would call 2015 a huge success. As life always does, it took a few unexpected twists and turns, but they were embraced and ended up working out really well. If you have not already done so, I urge you to take some time and set some goals for 2016. And then share them with the world (or at least some close family and friends). You may be asking yourself why I (or YOU for that matter) would share my goals with the world. You may have thoughts of what if I fail? What if people say I can’t do it? One final note before I get into my own goals for 2016. Goal #1 – 250 or more CrossFit Workouts. Note: I joined CrossFit on 11/30/15 in preparation for making 2016 a banner fitness year and to make up for my big wiff in 2015. In order to get a bit of a jump start on my efforts, I have engaged in a little competition in the form of a body fat lost challenge that is being hosted by the box I joined to do CrossFit. It starts on 1/16/16. It will last 105 days until 4/30/16. We will get our body fat measured on the 1st and last day of the competition. Nothing motivates me more than a little competition. Goal #6 – Earn $270K in gross income. Goal #8 – Pay down the mortgage by $25,200 in 2016. This will keep us on track for our 7 year 3 month pay off goal. Goal #9 – Contribute $24,650 to Pre-Tax accounts (401K & HSA). Our income will be too high to get any tax benefit for contributing to an IRA for my wife, so that is a bummer. But will play the cards we are dealt. Goal #10 – Refinance our investment condo to free up cash flow. The goal would be to do this in the first half of the year and to free up $150 to $300 in monthly cash flow. Goal #12 – Keep a Journal with the things that I am grateful for and love about my wife. I am setting a goal of 250 entries. I have been with my wife for over 10 years now, and it is easy to become complacent…this will bring back to the front of my mind what I love about my wife and remind me how lucky I am to have her. The end goal is then to get this bound and printed to give to her as a Christmas Gift. Tracking the financial goals happen naturally especially since starting this blog and providing so much transparency. But a big part of the reason my fitness goal for 2015 failed was because I failed to create a plan for tracking my progress. I tried to wing it and it back fired in a big way. So, this year I decided to create a 1 page simple tracking system for each goal. 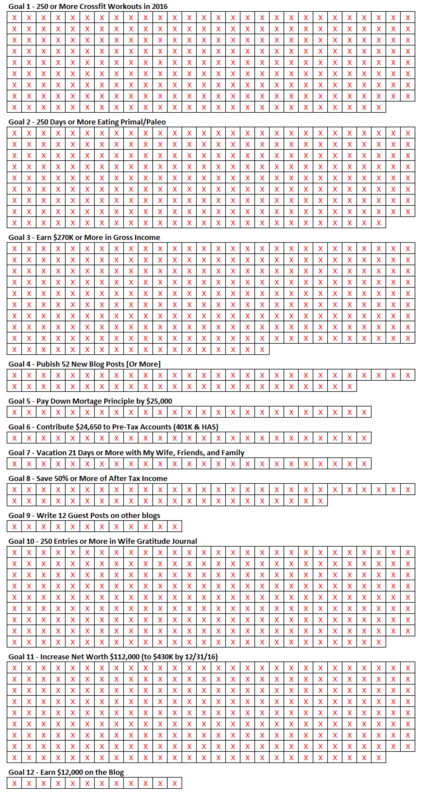 For example, in goal #1 below you will see that I have 250 squares available that represent the 250 workouts I plan to complete in 2016. Obviously I will delete the X’s in each square before I print this out. But this is what it should look like by the end of the year. For the financial goals, each square will represent $1,000 increments. And each square for the 50% savings goal will represent 1%. Okay so there you have it. These are my goals for 2016. Let’s leverage everything we accomplished in 2015 to make 2016 another EPIC year. 2016 represents a NEW BEGINNING…It’s a whole year dedicated to you and your ASPIRATIONS…Take advantage of this year to continue moving FORWARD and FINISH STRONG! How was your 2015? Did you achieve all of your goals? Were there things that you decided were no longer important? What do you have planned for 2016? Great set of goals. I may be copying a few of them! Thanks Adam! Feel free to copy as many as you like. Lofty set of goals! I wish you the best in 2016. And same to you FF! Thanks for sharing Dom! Congrats on all the 2015 wins, and best of luck for a stellar 2016. Cheers! Can’t wait to hear what your goals on on our next call. I love that vacation days is one of your goals. And the book for your wife is a great idea as well. Good luck in 2016 and Happy new year! I can tend to become a workaholic if I don’t put vacation in as a goal. I’ve got a number of goals, but struggle with effective systems. A big one I made progress on in 2015 was reducing my ‘cursing’. It is unnecessary in my life, a net negative; my discipline and mindfulness in vocabulary came a long way, with a few slips. “Ben Stein’s How To Ruin Your Life” style advice, written in ironic reverse-psychology form. Hope it gives you a smile, it is really real and I will be referring to it all year long! Try this —- make a list of all the people you know that have f***ed you over, and those who haven’t. Mark the ones who haven’t as “not yet.” Rank the ones who have from A through C. Keep the paper on your night stand under your hand gun. Each morning read the list, visualize the person and shout “f**k you all!” Then get on with your day. Be sure to leave instructions that the list be read aloud at your funeral. Right? Happy New Year, everybody! JayCeezy – Always a pleasure getting positive feedback. Hopefully the writing has gotten better over the course of the last 15 months of this sites life. The book recommendation is actually on my Amazon Wishlist just waiting for it’s turn to be delivered. I try to only order just enough books to qualify for the Free Shipping as my unread books at home run dry. These days the list seems to grow faster than I can read them. I have had slow down on the reading front in order to make time for writing this blog…which is a trade off I gladly make. It just means I get through the reading list a bit slower…which probably isn’t a bad thing. I totally agree with you when it comes to systems. They are absolutely critical to hitting your goals. The simpler the better in my opinion. Regarding your goal of less cursing, I have heard of people starting a collection dish (for lack of a better word) and every time they curse they put $5 in. The catch is at the end of each quarter that money has to be donated/spent on something you absolutely despise. Now this is really funny >>> I have been informally diagnosed with having “early-onset Irish Alzheimer’s”…that is the one where I forget everything but my grudges. Also love the list to be read at the funeral. Loved this one so much, I had to read it to my wife, thanks for sharing. Congratulations on your accomplishments for 2016! I really liked your goals; specifically how measurable they are – even the fitness ones. Great tracking sheets. I may copy that method for one or two of mine this year. And good idea on the journal for #12. Creative way to stay focused on the good. One piece of advice, for #9, if one of you don’t have an Ira, you could likely add a backdoor Roth conversion to your investment savings goal. (Tricky if you already have an ira. )You seem to have the extra savings. You don’t get an upfront tax break, but you’ll shelter the growth from cap gains taxes. Looks like I had to fish you out of the SPAM…every once in a while I find a diamond in the ruff…so glad I go through it periodically. I agree on the tracking sheet, I think I developed a winner. It’s simple and has added a layer of gamification. I really want to earn those X’s. Unfortunately we both have an IRA, they both started due to roll overs upon moving companies. Then my wife’s we started contributing too since here current employer doesn’t offer a qualified retirement plan to contribute too. Several people have now recommended the backdoor Roth conversion. So, I will evaluate that as an option in 2016. Why is it tricky if we already have an IRA? Great sets of goals and very challenging. Will be keeping an eye on how you are doing. Awesome – crossfit is addictive! Be careful on the deadlifts! It’s incredible how fast your net worth is growing… Exciting to see whether you can ramp up your blog income, what a great source of passive income (well not completely passive). Hey Will – Yes, I have already caught the crossfit addiction. I started in December as a way to ease my way into my new years goals. There is not a day I am not sore, which is amazing. The thing I love about the Box I am apart of is the emphasis on form before every workout begins. It certainly has been growing at a rapid clip. Wait til you see January’s report, it is about to take another huge move to the upside. What is interesting is that 95% of the growth has come from pure savings/contributions. My cash pile both in my brokerage accounts and bank account continues to swell as we patiently wait for much better opportunities. I started using the app “Way of Life” for a quick daily check off on my goals. Highly recommend it. Mine just sends me an alert at 9 pm and I click through the questions in a few seconds. Of course. We read the same books, so I should have predicted we use the same apps. Love the simplicity there with your goals.. Although I would have felt that 12 is too many, sure with your tracking system you’ll make it work.. Looking forward to hearing and sure I’ll read about Costa Rica and as for goals I’ve recently been getting a lot more active and consistent around them, it’ll be an evolving process although getting much clearer :)! It’s funny you mention that you feel it was too many…I just finished writing my August update and mentioned the same exact thing…think I will shoot for half as many for 2017. Glad to hear your dialing in your own goal setting and achieving process. Still have a bit to go on being held accountable on them although a big way to achieve them is simply by asking and not being concerned with rejection + collaborating with others effectively!